If you are entering into these Terms on behalf of an organization, you hereby warrant that you have the authority to do so. CallApp may update these Terms from time to time and such updated Terms will be effective as of the “Last Updated” date. Your continued use of the Service on or after the “Last Updated” date constitutes your consent to such updated Terms. 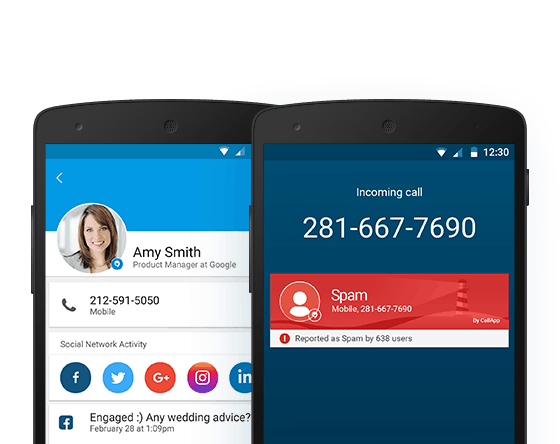 The Service is a global phone community and social phonebook network, enhancing your ability to identify callers and providing related web-based services and tools to act upon that information (like writing a note). The Service may also provide you with complementary information pertaining to the contacts stored on your device (“Contacts“), such as photo, job title and company, email address, website, IM addresses, if such information is available through CallApp’s data resources (“CallApp’s Resources”) or through CallApp’s partners’ data resources, or over publically available online databases and other public data resources (“Public Resources”). In addition, you are able to send SMS and MMS messages, record your calls and upload and share certain Content (as defined below) to the Service, including contact information such as your name, email address, or social network identifier. Please be aware that information provided to you, or accessed by you, in connection with the Service or otherwise by CallApp may be incomplete, inaccurate, objectionable or outdated, and CallApp disclaims all responsibility and liability with respect thereto. To transmit and receive updates on real-time to and from the Service, the Service requires an online connection of your mobile device to the internet (such as wi-fi, 3G or 4G). All costs of such connection are at your expense, as dictated by your communications service provider (cellular company) and in accordance with its applicable payment terms. Subject to the limitations and restrictions provided in these Terms, CallApp hereby grants you a limited, personal, free-of-charge, non-exclusive, non-sub-licensable, non-transferable, revocable: (i) right to use the Services, and (ii) license, to download, access and use the Software; and in both cases on a device that you own or control, for the sole purpose of your personal, non-commercial use of the Service (collectively, “License”). These Terms does not convey to you any interest in or title to the Software, but only limited rights to use the Service solely in accordance with the License and these Terms. This License does not allow you to use CallApp’s name, trademarks or other commercial symbols. All rights and licenses not expressly granted to you under these Terms shall be retained by CallApp. In the event that you wish to use the Service as part of your own application, a separate agreement with CallApp is required. The following restrictions are strictly prohibited with respect to the Service including the Software. Your failure to comply with any of these restrictions may result in the immediate termination of your License and your right to access and use the Service, and may also expose you to civil and/or criminal liability. Use the Service in connection with activities or material which a reasonable person could consider to be stalking, defamatory, libelous, fraudulent, pornographic, or threatening; or advocating harassment, racism, abuse, hatred or physical harm against any group or individual; or disparaging the religious, political, or legal agenda of any group or individual. Access, or attempt to access, the Software other than through the interface that is provided by CallApp, unless you have been specifically allowed to do so in a separate agreement with CallApp. Use of the Service requires registration. In order to become a registered user of the Service, you may be asked to provide us with several details about yourself, such as your full name, telephone number, active email address and residence information. You must provide full, accurate and truthful information. Providing wrongful or erroneous information may prevent you from using the Service and may prevent CallApp’s ability to contact you and may result in CallApp terminating the License and your right to use the Service. CallApp may in its sole discretion and at any time temporarily or permanently suspend or block a user from using the Service, immediately and without liability. CallApp may in its sole discretion and at any time cease the operation of the Service or any part thereof, temporarily or permanently, immediately and without liability. The following provisions of these Terms will survive termination for any reason: 3, 5, 6, 7, 8, 9, 10, 11, 13, 16, 17, 18, 19, 20, and 21. You may submit and upload information, including Collected Information, into the Service as content (“Content”). Content may take the form of your profile information, contact information, or other types of data, that you upload or otherwise share. You are solely responsible for your Content. You warrant that you own all right, title and interest required for the use of your Content in the manner contemplated in these Terms, that you have the right to share your Content with CallApp, the Service, and other CallApp users, and that your Content is not false and will not disrupt or corrupt the Service and is otherwise consistent with these Terms. You represent and warrant that: (i) your use of the recording call feature will not breach or infringe on the rights of Contacts or any other participant of such recorded calls, including the right for privacy, and (ii) you will review all applicable laws, and to the extent required, obtain such needed legal counsel before you use or allow others to use the recording call feature. CallApp expressly disclaims any and all liabilities related to, or arising from, your use of our recording call feature or your incompliance with applicable law or any of the foregoing requirements and representations. You hereby grant CallApp a non-exclusive, permanent, worldwide, non-revocable, royalty-free, sublicensable and transferable license to use your Content and other information in any way at CallApp’s sole discretion, including without limitation to reproduce, distribute, publically perform, reproduce, edit, translate, reformat, make derivatives of it, incorporate it into a collective work, and use it in order to promote CallApp’s business in any way, without the need for any further compensation, approval or consent. CallApp may monitor Content or other information made available by or otherwise received from users through the Service but cannot and does not guarantee that it will monitor, or the source, completeness, currency, or correctness of any Content or other information. You accept that through the Service you may be exposed to Content or other information that is false or objectionable. Without derogating from any other provision herein, you agree that you shall bear all risk and responsibility associated with the use of Content or other information, and that CallApp shall not be liable in connection therewith. In addition, you should not have any expectation of privacy with respect to Content. Except for the License granted in accordance with these Terms, all rights in and to the Service are reserved, and no licenses, implied or otherwise, are granted by CallApp. You agree not to challenge CallApp’s rights in or otherwise attempt to assert any rights in the Service, except those explicitly granted under these Terms. You are hereby prohibited from removing or deleting any and all copyright notices, restrictions and signs indicating proprietary rights of CallApp, including copyright mark [©] or trademark [® or ™] contained in or accompanying the Software or the content included in the Service, and you represent and warrant that you will abide by all applicable laws in this respect. You are further prohibited from using, diluting or registering any name, mark, logo or other commercial symbol that is identical or confusingly similar to any of CallApp’s marks and logos, whether or not registered or registrable. Third-party trademarks, product names and brands which may appear in the Service are the property of their respective owners, including all goodwill associated with such trademarks and product names. You agree not to use or disclose any of CallApp’s Confidential Information except in connection with your authorized use of the Service. “Confidential Information” means all non-public information disclosed to you by CallApp in connection with the Service that is designated by CallApp as being confidential or that you should reasonably understand to be confidential, including without limitation all non-public aspects of the Service such as the Software. Some Third Party Software may be open source software. To the extent these Terms conflict with the terms of an open source license, the open source license terms will prevail. You may request a copy of the open source licenses we use by contacting us at support@callapp.com. OPEN SOURCE SOFTWARE IS PROVIDED “AS IS” WITHOUT ANY EXPRESS, IMPLIED, OR STATUTORY WARRANTY OR GUARANTEE OF ANY KIND. CallApp may integrate commercials, advertisements and/or sponsored links (“Advertisements”), whether within or beside the Service. By clicking an Advertisement, you may be transferred to a service of an advertiser or receive any other content, messages, information or offers from the advertiser and from others. All information contained in Advertisements is solely controlled by the relevant vendor, and CallApp neither controls Advertisements nor makes any warranty or representation with respect to their accuracy, appropriateness or content. You agree that your use of the Service, in this respect as well in all other matters, is at your sole and exclusive risk. Updates to the Software may be automatically downloaded from the Service and installed on your device from time to time. These updates may take the form of bug fixes, enhanced functions, new actions and new versions of the Software. You acknowledge and agree to receive such updates from CallApp and hereby permit CallApp to deliver these updates to you and install them automatically on your device as part of your use of the Service. CallApp has the right but not the obligation to monitor any activity and content associated with the Service. CallApp may investigate any reported violation of these Terms and take any action it deems fit, including terminating your access and use of the Service without any prior notice. If CallApp suspects that your activity violates any law or regulation, CallApp may report to the appropriate law enforcement authorities or other third parties. You hereby represent and warrant to CallApp that: (i) the information you have provided to CallApp is complete and accurate, and (ii) you are above the age of thirteen (13). You shall update your account information to maintain the accuracy of such information during the term of these Terms. CallApp may change the Service’s layout and design and the availability of Content and functions included therein or may change the form, features or nature or all or part of the Service from time to time without providing any prior notice. CallApp may also temporarily or permanently cease or discontinue providing any or all of the Service, support, updates and/or upgrades at any time. You hereby agree and acknowledge that CallApp shall bear no liability with any of the foregoing. NOTWITHSTANDING ANY OTHER PROVISION OF THESE TERMS, THE SERVICE INCLUDING THE SOFTWARE LICENSED UNDER THESE TERMS ARE PROVIDED ON AN “AS IS” AND “AS AVAILABLE” BASIS. NOTWITHSTANDING ANY OTHER PROVISION OF THESE TERMS, CALLAPP MAKES NO GUARANTEE OR WARRANTY OF ANY KIND, EXPRESS, IMPLIED, STATUTORY OR OTHERWISE, INCLUDING BUT NOT LIMITED TO ANY IMPLIED WARRANTY OF USE, MERCHANTABILITY OR FITNESS FOR A PARTICULAR PURPOSE, OR IN CONNECTION WITH THE INSTALLATION, USE, PERFORMANCE, RELIABILITY, ACCURACY OR QUALITY OF THE SERVICE, OR IN CONNECTION WITH TITLE, NON-INFRINGEMENT, PRIVACY, NON-INTERFERENCE, OR AVAILABILITY IN ANY LOCATION, OR ANY WARRANTIES AND RIGHTS IMPLIED UNDER THE US UNIFORM COMMERCIAL CODE, UCITA (UNIFORM COMPUTER INFORMATION TRANSACTIONS ACT) OR COMMON LAW. CALLAPP DOES NOT WARRANT THAT THE SERVICE WILL MEET YOUR REQUIREMENTS, THAT THE OPERATION OF THE SERVICE WILL BE UNINTERRUPTED OR ERROR-FREE, THAT YOUR CONTENT OR COLLECTED INFORMATION OR OTHER INFORMATION WILL NOT BE LOST OR CORRUPTED, THAT INFORMATION CONTAINED IN THE SERVICE INCLUDING WITHOUT LIMITATION PHONE NUMBERS, NAMES AND PHOTOGRAPHS WILL BE CURRENT, COMPLETE OR ACCURATE, OR THAT THERE WILL NOT BE DAMAGE TO YOUR DEVICE. USER IS SOLELY RESPONSIBLE FOR COMPLIANCE WITH APPLICABLE LAWS AND REGULATIONS. CALLAPP DOES NOT WARRANT, ENDORSE OR GUARANTEE, AND IS NOT RESPONSIBLE FOR, ANY ACTION OR NON-ACTION IN CONNECTION WITH A THIRD PARTY, INCLUDING WITHOUT LIMITATION ADVERTISERS, PARTNERS, OTHER USERS OF THE SERVICE AND PARTIES WHO OFFER SERVICES THROUGH THE SERVICE. YOU ACKNOWLEDGE THAT YOU WILL EXERCISE YOUR OWN INDEPENDENT ANALYSIS AND JUDGMENT IN YOUR USE OF THE SERVICE. CALLAPP ASSUMES NO LIABILITY FOR YOUR USE OF THE SERVICE, AND YOU EXPRESSLY ACKNOWLEDGE AND AGREE THAT NOTWITHSTANDING ANY OTHER PROVISION OF THESE TERMS, USE OF THE SERVICE, INCLUDING WITHOUT LIMITATION THE DOWNLOADING OF THE SOFTWARE ON YOUR DEVICE AND THE UPLOADING, SHARING AND USE OF CONTENT, IS AT YOUR OWN RISK. CALLAPP WILL NOT BE LIABLE FOR ANY DAMAGES OR INJURIES TO YOU OR TO ANY THIRD PARTY, IN CONNECTION WITH OR RESULTING FROM ANY CAUSE WHATSOEVER. NOTWITHSTANDING ANY OTHER PROVISION OF THESE TERMS, IN NO EVENT WILL CALLAPP BE LIABLE FOR ANY DAMAGES IN CONNECTION WITH THESE TERMS OR THE SERVICE, RESULTING OR ARISING FROM LOSS OR RECOVERY OF DATA, GOODWILL, THE VALIDITY OR CORRECTNESS OF ANY CONTENT OR OTHER INFORMATION (INCLUDING COLLECTED INFORMATION) STORED, PROCESSED OR TRANSMITTED VIA THE SERVICE, LOSS OF USE OR LOSS OF REVENUE OR PROFIT, OR BE LIABLE FOR ANY DIRECT, INDIRECT, INCIDENTAL, SPECIAL, CONSEQUENTIAL (INCLUDING, WITHOUT LIMITATION, ATTORNEYS’ FEES) OR OTHER DAMAGES, REGARDLESS OF THE CAUSE OF ACTION, WHETHER IN CONTRACT, TORT (INCLUDING NEGLIGENCE), STRICT LIABILITY OR ANY OTHER LEGAL OR EQUITABLE THEORY, EVEN IF CALLAPP HAS BEEN ADVISED OF THE POSSIBILITY OF SUCH LOSSES OR DAMAGES AND EVEN IF THE POSSIBILITY OF SUCH DAMAGES IS FORESEEABLE. YOU HEREBY ACKNOWLEDGE AND WARRANT THAT YOUR USE OF ANY INFORMATION OBTAINED IN CONNECTION WITH YOUR USE OF THE SERVICE IS AT YOUR SOLE DISCRETION AND RISK. YOUR SOLE AND EXCLUSIVE REMEDY WITH RESPECT TO ANY PROBLEMS OR DISSATISFACTION WITH THE SERVICE IS TO UNINSTALL AND CEASE YOUR USE OF THE SERVICE. NOTWITHSTANDING THE ABOVE, IF CALLAPP IS FOUND TO BE LIABLE BY A FINAL JUDICIAL RULING, CALLAPP’S TOTAL AGGREGATE LIABILITY TO YOU OR TO ANY THIRD PARTY SHALL BE LIMITED TO THE SUMS ACTUALLY PAID BY YOU TO CALLAPP (IF ANY) FOR THE SERVICE FOR THE 12 MONTH PERIOD IMMEDIATELY PRECEDING THE FIRST CLAIM FOR LIABILITY. You agree to defend, indemnify and hold harmless CallApp, its officers, directors, employees and agents, from and against any and all claims, damages, obligations, losses, liabilities, costs, debts, and expenses (including but not limited to attorney’s fees) arising from: (i) your use of the Service, (ii) your violation of any term of these Terms, (iii) your violation of any third party right, including without limitation any Intellectual Property, property, publicity, confidentiality and/or privacy right, and (iv) any damage of any sort, whether direct, indirect, special or consequential, you may cause to any third party with relation to the Service. Should you provide CallApp with any suggestions or ideas (“Suggestions“) pertaining to the Service, including bug fixes or improvements, CallApp will own all right, title and interest in and to the Suggestions and will be free to use the Suggestions for any purpose without any liability or payment to you. You hereby irrevocably assign all right, title and interest in and to Suggestions to CallApp, and agree to provide CallApp with reasonable assistance, at CallApp’s cost, if such is required or desirable in order to document, perfect and maintain CallApp’s rights in and to the Suggestions. The Terms shall be construed and governed in accordance with the laws of the State of Israel, regardless of its conflict of laws rules. The competent courts of Tel Aviv, Israel, shall have sole and exclusive jurisdiction over any dispute under the Terms or otherwise related to the Service. The Terms represent the complete agreement concerning the license granted and the subject matter herein. If any provision of these Terms is held to be unenforceable, such provision shall be reformed only to the extent necessary to make it enforceable. The failure of either party to enforce at any time any of the provi­sions of the Terms will in no way be construed to be a present or future waiver of such provisions, nor in any way affect the right of either party to enforce each such provision thereafter. The express waiver by either party of any provision of the Terms will not constitute a waiver of any future obligation to comply with such provision. Callapp may assign its rights and obligations under the Terms to any third party at its sole discretion. You may not transfer or assign your rights and obligations under the Terms without the prior written consent of CallApp. CallApp reserves the right to update these Terms from time to time. In our sole discretion we may post updates to CallApp’s website. Updates to these Terms are effective as of the “Last Updated” date, and your continued use of the Service on or after the Last Update date will constitute acceptance of, and agreement to be bound by those changes.